Affordable Quality Roofing is the best Commercial Roofing choice for building owners, property management firms, strata complexes and cooperative housing. Our commercial roofing services provide exceptional value and an expert approach that gives our clients peace of mind. We specialize in replacing flat roofs, built-up roofs, waterproofing, torch-down system, preventative roof maintenance and slope roofing, industrial, institutional, residential, and multi-family properties. We only use roofing materials from the industry’s top manufacturers and stand behind our work with an outstanding warranty. Our safety program is based upon Work safe BC policies and procedures and we always have a third party safety Coordinator visits job sites. We are consistently training our staff to be safe and to ensure the safety of our clients. In addition, all major projects are supported by customized safety plans for the specific needs and conditions of each roof. We take great pride in a solid safety record and our safety department meets regularly to establish, enforce and update our procedures. 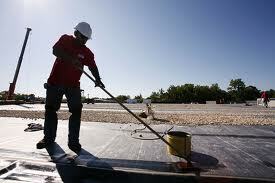 Making a decision about which company should handle your commercial roofing needs is difficult. Our commercial roofing technicians have the expertise to meet and exceed your expectations. Allow us to perform your roof to greatly extend the life of your existing roof.